There is no denying it: Food waste is a serious problem. When we take farm, retail, and domestic waste into account, an estimated 40 percent of the food produced in the United States goes uneaten. And while a great deal of systematic change is in order, one solution is to make sure we eat more food deemed inedible. You may have heard about the scheme by ex-Trader Joe’s executive, Doug Rauch, to sell prepared meals using “expired” foods.” Well, he’s not the only one doing his part to put unused food to good use. From jam to wine byproducts, here is a list of businesses and organizations rescuing food from the waste bin. 1. According to the Natural Resource Defense Council (NRDC), produce makes up around 35 percent of the food we waste in this country (vegetables account for 20 percent, while fruit makes up 15 percent). It was numbers like those that inspired the people behind Rubies in the Rubble to give produce a new life. Based in the United Kingdom, the company makes chutneys, jams, and pickles out of fruits and vegetables that were destined for the trash. They work with UK growers, rescuing food at various parts of the supply chain and their kitchen also happens to be situated in a fresh produce market, where over 200 tons of food waste is produced every week. 2. In Paris, a small operation called Confiture Re-Belles is also making jam from discarded fruit around the French capital. Recently launched by one of the founders of Disco Soup, who was inspired by Rubies in the Rubble, the project is in its early stages and the jams are still made in a small Parisian apartment kitchen. 3. In Austria, people can get their hands on jars of Zero Waste Jam, made from fruit that comes in via donations, from abandoned and surplus sources as well as gardens and forests. Since fruit is being thrown away everywhere, the company is looking to expand into Switzerland and Germany, broadening their network and allowing them to bring re-purposed food to more people. 5. In winemaking, all the leftover stuff that comes after the grapes have been crushed is called pomace. More often than not, it’s destined for the compost or the dump. But Whole Vine Products takes a different route, using this byproduct in baked goods. In fact, they work with a local mill to turn the pomace into a gluten-free flour. They also make culinary oils from the grape seeds. Anyone care for a Cabernet brownie? 7. Food waste is especially hard to stomach when you consider how many people don’t have enough to eat. Oakland-based FoodShift is working with that city’s school district to get uneaten food from school cafeterias (where even unopened, unexpired milk gets thrown away) to hungry families. The group has redistributed nearly 5,000 pounds of food since May 2013. 8. Across the pond, the British organization FoodCycle is doing similar work. The group has a network of over 1,000 volunteers working at 15 different locations to make meals with surplus ingredients. Since launching in 2009, the organization has put 187,000 pounds of reclaimed food to use in its kitchens and served over 80,000 meals in communities that need it the most. 9. Dumpster diving is one common solution to food waste, but it can also be demeaning if you’re not, say, 19-years-old and covered in tattoos. That’s why Food Cowboy redirects discarded food from dumpsters to hungry people using technology. The group’s Web site connects food companies, truckers transporting food, and soup kitchens, making it easy to schedule pick-ups from local restaurants and distribution centers. Share your suggestions for No. 10 in the comments below! Photo of jam by Alice Blaise. Photo of the Regrained founders courtesy of ‎www.Regrained.com. 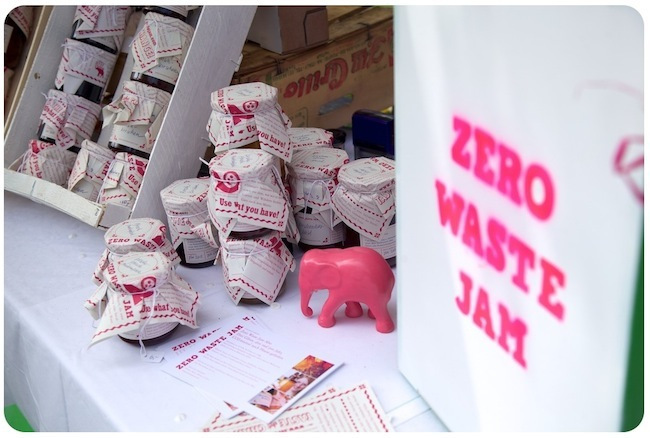 Photo of Zero Waste Jam courtesy of ZeroWasteJam.com. food not bombs also focuses on using food which will otherwise go waste. one difference is we do not consider our selves charity or business. Helping to fight food waste can be as simple as looking for the _oldest_ milk carton or jarred food on the shelf. Extra points for taking an item at or even a little beyond its expiration. If you're going to use an item quickly, you don't need to buy the freshest on the shelf. Now that I have a laying flock of hens, much of the food that would have gone into our compost is now *either* fed directly to my free-range birds, whose eggs feed us, our neighbors and our pets, or to the mealworms I culture for feeding to the birds and to gain the frass for my food production. People who know me know how deeply I detest food being wasted, so this issue speaks to me on a visceral level, if you will. EatXtra.com is trying to cut down on food waste in majors cities across the USA. Our Putting Stock in Your Community initiative recovers bones from farmers, butchers and restaurants, combines them with blemished recovered produce from farmers markets and makes soup stock. We then use the stock to make soups with recovered veggies and stuffing muffins with recovered bread.